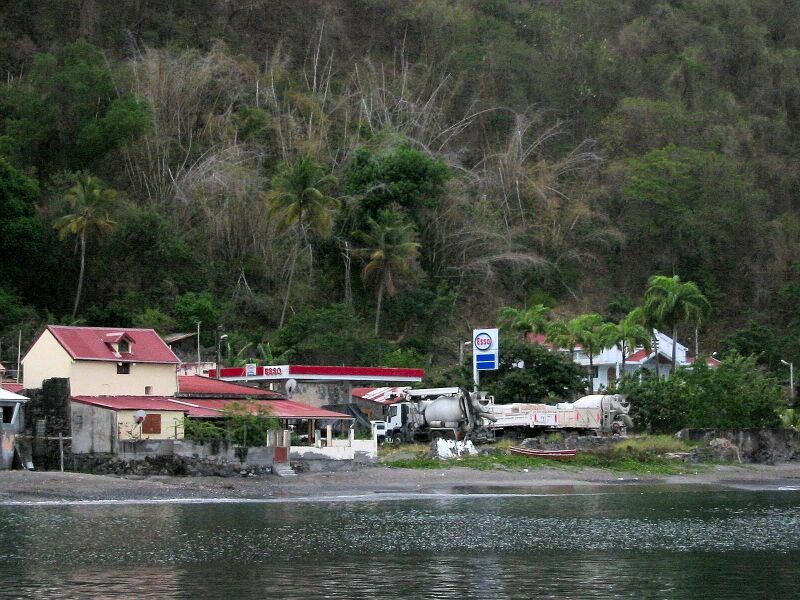 As was mentioned in Guadaloupe II, we left Guadaloupe on May 8th early in the morning and sailed past Marie Galante (a large round island to the Southeast of Guadaloupe - it is part of Guadaloupe though), and then on past the east side of Dominica. Frank decided it would save some distance and time going to the windward side of the island, and the winds seemed at the right angle for it. It turns out he was right, but the windward side was certainly more choppy. It made for an uncomfortable few hours of sailing. It also meant stronger winds which didn't help the jib halyard. 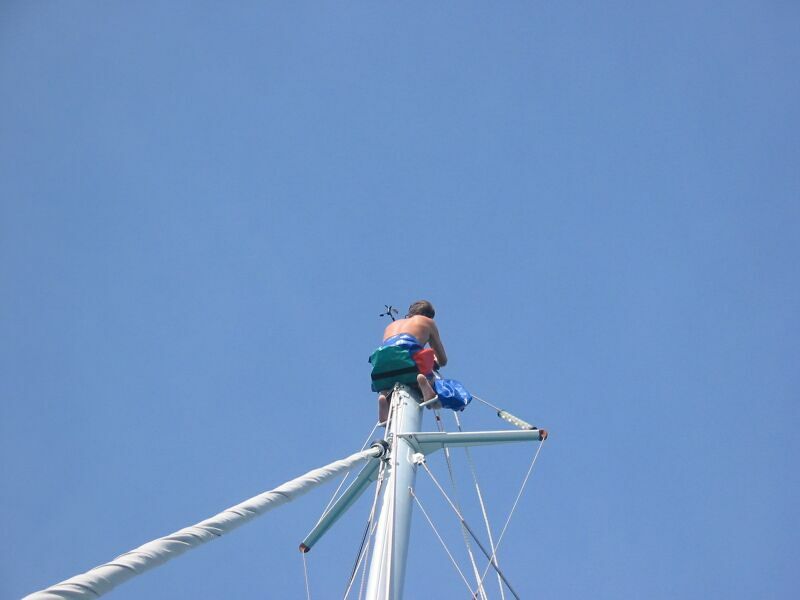 The temporary fix we made in Guadaloupe to the jib halyard turned out to be more temporary than we wanted. The rope halyard Frank put in place lasted a total of about four hours - it broke loose as we started passing Dominica. Fortunately, with one reef in the jib, the jib halyard wasn't needed and the sail stayed up on the furler without slipping down. So, we continued our sail all the way to Martinique. We arrived in the now familiar anchorage of St. Pierre at about 6:15 PM - just before dark. Our average speed for the whole trip was 7.7 knots - not bad! We decided to try and call Nosille on the SSB at 8:00, so we turned off the engines (to get better reception). We made the hail, and immediately Hotel California piped in. So, we changed frequencies and chatted with them. It turns out, the reason we hadn't heard from them in the last couple of days is that their laptop went bad and they couldn't check SSB E-mail. Anyway, we found out that the problem Wilson had mentioned with their traveller was part of the reason they were rushing to Grenada. 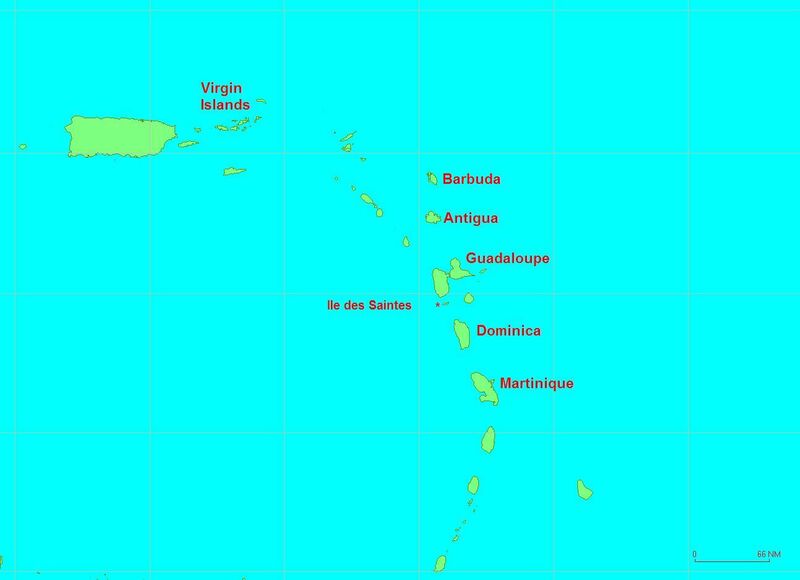 They couldn't find anyone with the parts in Martinique or St. Lucia. So, they're hoping to get it in Grenada. And, they needed to be there in time to pick up Wilson's father. After we finished with HC, Frank hailed Nosille again and got them. Frank spoke with Roger, and we found out they were headed to St. Pierre and planned to meet a couple of boats there and spend the weekend there. 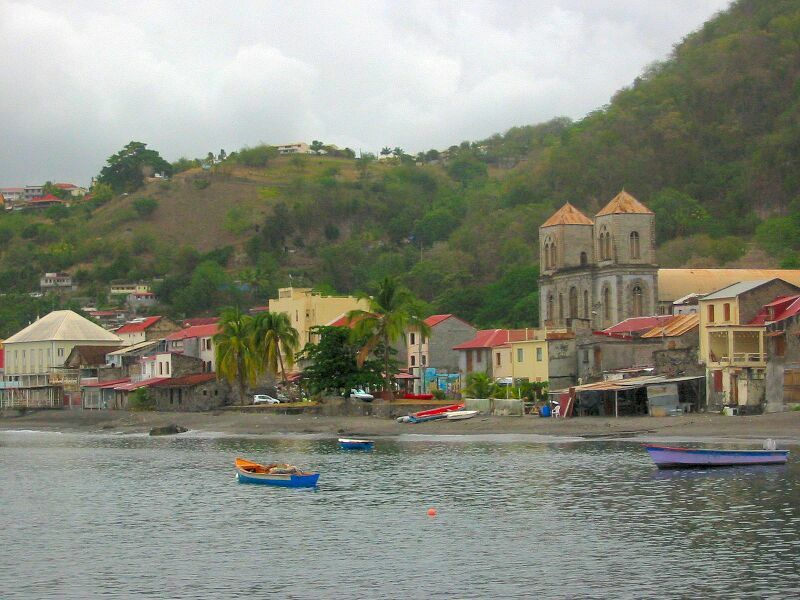 We told them our plans, and told them we might meet up with them here in Martinique before we head south. Shoelcher and Fort de France - "Talkie Walkies"
We motored on towards Schoelcher. It is a nice little anchorage with a picturescue town. Most of the boats anchored here are locals. We anchored at 8:45 AM - after only 10 miles from St. Pierre. We got ready, put the dinghy down, and went to the local dock. We planned to go into Fort de France and shop for the jib halyard replacement and some new walkie talkies (Frank had dropped another one overboard). We stopped at a hotel who, with a little help from the phrase book, told us where the bus stop was. We found it eventually and got on a local bus into town. The bus took us right past Sea Services and stopped only a couple of blocks away. We all went to Sea Services and fortunately the woman owner is English-Canadian and speaks perfect English as well as French. She helped Frank work with her staff to resolve our halyard needs. They made the cable there for us (Frank had brought the original cable for measurement). Karen tried an electronics store where Sea Services suggested to look for the walkie talkies. That store didn't have any. We went to McDonalds for lunch, then Frank went to customs while Karen went looking around town for the walkie talkies. Frank got done really quick with customs - only 9 minutes - and had us cleared out for Monday, so Frank went to Le Web (a nice Internet Bar/cafe run by a nice Irish woman) to get on the Internet. No really big news, but it was nice to get on the Internet and get updated. Even beter this time there wasn't much smoking going on. Frank met Karen and the girls in the park at a prearranged time. They didn't find the walkie talkies, but were told a store near the Galleria would have them. We took the bus, and managed to get dropped off at the right spot. We walked to Connexion, a Circuit City look-alike, but they didn't have the walkie talkies. They suggested another place. We walked back across the highway to the mall and HyperU for some minor items Frank called a taxi and we got the same guy again - the guy with the silver Mercedes. He didn't seem to recognize us, and still doesn't speak any English. The taxi driver took us to the other store - after a bit of hunting. They had the "talkie walkies" - the French always have to have a different name - but at $366 Euros! - we decided to skip it. The taxi then took usback to Shoelcher and we dinghied back to our boat. Frank, with some help from Patricia, managed to install the new halyard in just two hours this time. It fit perfectly and looks like it will last a long time. Frank took a file and smoothed out a worn spot at the exit point of the mast at the top. This was probably the reason the rope halyard didn't last. The next morning, after a bit of homeschooling, we called Nosille again. We decided we would sail back up to St. Pierre and visit with Nosille before heading south again. We caught up with Nosille at the market in St. Pierre. They wanted to have us over for tea. Meanwhile, we went to a restaurant to have lunch. Catherine tried octopus for her meal and actually ate a good portion of it. The girls went swimming with Pippa and Amelia stayed on Nosille to bake a cake. Frank and Karen went over for tea at 4 PM and we had some of the cake as well. The four girls continued swimming while the parents all chatted. Frank brought over the laptop and shared some of the pictures of our trip with Nosille. Meanwhile, the kids went to PatiCat and watched a movie. We finally took Nosille's kids (Pippa and Amelia) back to Nosille around 8:30 PM after saying our Au revoirs. We planned to get up very early to sail all the way to Bequia - about 110 miles. 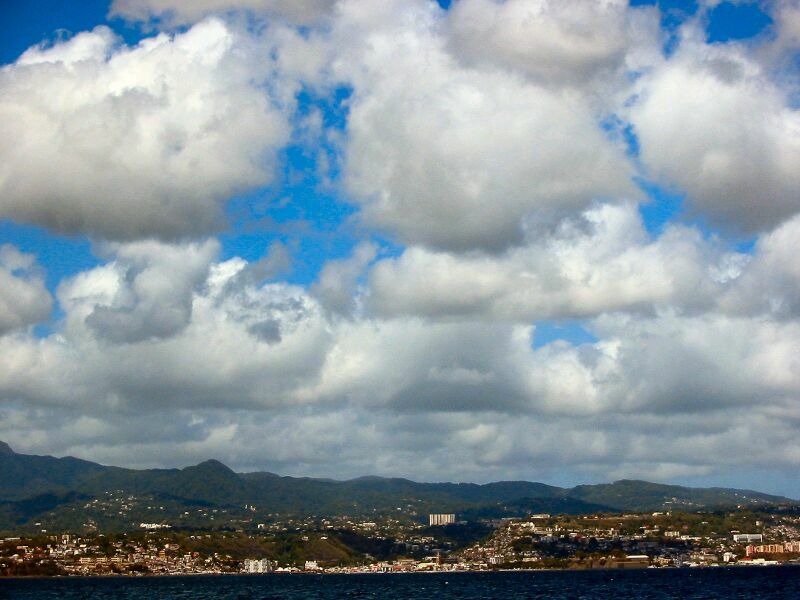 Read about the trip down to the Bequia in Grenadines Part II.